She married Willie B. Clark, about 1910.3,6 Willie was born May 1 18892,3,4 [May 4 18897], Alabama2,3,4 [Brans Creek, Tennessee7]. Neomia/Norreen E. Clark, born c1912. Edward Clark, born c1914; apparently died young. Mary B. Clark, born c1915. Clyde Lonnie (Lonnie Clyde) Clark, born 1916. Joseph R. Clark, born c1922. Elmer P. Clark, born c1923. Clark, Willie B., head-of-household, age 31, born in Alabama; parents born in Alabama; rented home; occupation: farmer, general farm. Clark, Allice, wife, age 28, born in Alabama; parents born in Alabama. Clark, Neomia, daughter, age 8, born in Alabama; parents born in Alabama; attended school. Clark, Edward, son, age 6, born in Alabama; parents born in Alabama. Clark, Mary, daughter, age 5, born in Alabama; parents born in Alabama. Clark, Clyde L., son, age 3 years 1 month, born in Alabama; parents born in Alabama. Clark, Willie, son, age 1 year 2 months, born in Alabama; parents born in Alabama. Clark, Willie B., head-of-household, age 40, born in Alabama; parents born in Alabama; first married at age 21; rented home; no radio in home; occupation: farmer, general farm; not a war veteran. Clark, Alice, wife, age 38, born in Alabama; parents born in Alabama; first married at age 18; occupation: laborer, general farm. Clark, Norreen E., son [sic], female, age 17, born in Alabama; parents born in Alabama; occupation: laborer, general farm. Clark, Mary B., daughter, age 15, born in Alabama; parents born in Alabama; attended school; occupation: laborer, general farm. Clark, Lonnie C., son, age 13, born in Alabama; parents born in Alabama; attended school; occupation: laborer, general farm. Clark, William B., son, age 11, born in Alabama; parents born in Alabama; attended school; occupation: laborer, general farm. Clark, Joseph R., son, age 8, born in Alabama; parents born in Alabama; attended school. 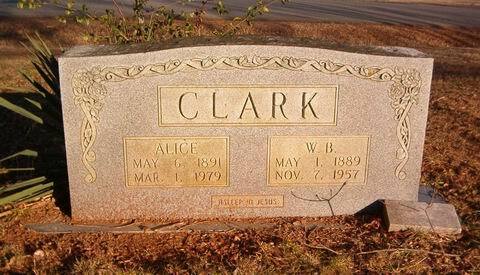 Clark, Elmer [unclear] P., daughter, age 7, born in Alabama; parents born in Alabama; attended school. Langston, Ira E., uncle, age 73, born in Alabama; parents born in Alabama; widower. 1900 census, Harmony Precinct, Jackson County, Alabama; ED 43, page 289A, line #19, dwelling #43, family #43. 1920 census, Princeton Precinct, Jackson County, Alabama; roll T625-19, ED 40, page 4B, line #88, dwelling #79, family #85. 1930 census, Maysville Precinct, Madison County, Alabama; roll T626-37, ED 13, page 9B, line #64, dwelling #163, family #175.